The Double-Chooz collaboration gathers about 160 physicists and engineers from 38 Institutes in 8 countries. Located next to the Chooz nuclear plant in the French Ardennes, the experiment is designed to study neutrino oscillations from the flux of electronic antineutrinos emitted from the two nuclear reactors of the plant. Compared to previous generation reactor neutrino experiments, Double-Chooz uses two detectors rather than one, in order to reduce normalisation uncertainties. One of the detectors is located about 1 km from the cores, while the second one is at about 400 m.
First results with only the far detector were presented in November 2011, showing evidence for an non-zero value of the θ13 mixing angle. In 2016, the Collaboration presented for the first time results based on the analysis of data from the two detectors. The comparison of rates and energy spectra of electronic antineutrinos recorded by the two detectors, which are as alike as they can be, allows a significant reduction of the systematic uncertainties in the measurement of the parameter sin2(2θ13) that governs the oscillation of the electronic flavour to another flavour at short distance. The obtained value is significantly different from zero with a relative precision of 15%, in agreement with the even more precise result by the Daya Bay experiment, in China. The fact that mixing angle θ13 could be measured non-zero with such precision is one of the most striking neutrino physics results in recent years. In addition, Double Chooz has produced a measurement of the reactor neutrino cross section, irrespective of the oscillation phenomenon, with a relative precision of de 1.2%. This measurement is key to the understanding of the reactor neutrino anomaly, which was revealed by Irfu physicists in 2011. The reactor neutrino anomaly has to do with a systematic deficit of the measured flux of antineutrinos compared to the calculated ones, by the most sophisticated models of antineutrino production in the core of nuclear reactors. One of the proposed hypotheses to solve the anomaly is the existence of a fourth flavour of sterile neutrinos. Irfu physicists and engineers were at the origin of the Double-Chooz experiment. They have been in charge of the technical coordination, as well as of the design and construction of the various acrylic vessels. The groups has put in place the measurement of the mass of the liquids involved, and has performed compatibility tests for all the materials. SPP physicists are main players in the data analysis and the production of scientific results. The Double-Chooz experiment will be decommissioned in 2018. 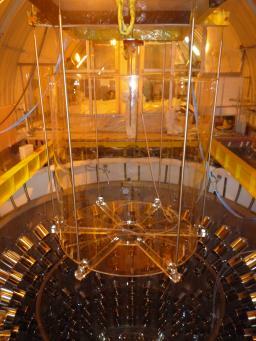 The Nucifer experiment, installed next to the research reactor Osiris at Saclay, was designed to follow the fuel cycle in the core of reactors from the measurement of the flux of antineutrinos, and consequently to provide a tool to survey nuclear plants for non-proliferation purposes. The techniques involved in Nucifer to measure the flux of antineutrinos very close from the core of a reactor have paved the way to the data analysis in Double Chooz. The CeSOX experiment proposes to position an intense radioactive source of Cerium 144 known as CeANG (for Cerium Antineutrino Generator) beneath the Borexino neutrino detector at the Gran Sasso Laboratory, next to L'Aquila in Italy. The CeANG source is being produced by the P. A. Mayak Company in Russia, and will be delivered early in 2018. The scientific goal of the CeSOX experiment is to demonstrate the existence of a fourth flavour of sterile neutrinos that would elucidate the reactor neutrino anomaly (see above), or to exclude its existence in a significant region of the parameter space. The SPP low-energy neutrino group gathers four physicists and two PhD students. The group leader is Thierry Lasserre.